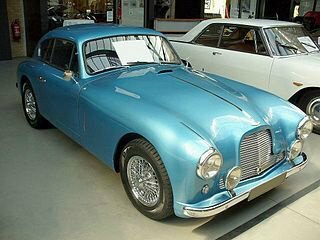 In 1953, the DB2 sports car, the best-selling Aston Martin to date, was replaced by the Aston Martin DB2/4 Mark 1, priced at £2,621, which was offered as a Drophead Coupe, a 2+2 Hatchback Saloon, and a small number of Bertone designed Spider convertibles. It had an aluminium body with a kerb weight of 1195 kg, and early cars were prepared by the legendary coachbuilder Mulliner although, by 1954, this was changed to the Tickford Company. By modifying the area around the back axle, it was possible to introduce two rear seats together with an increase in the rear roofline, and convert the rear section into a hatchback. Additions included the use of a wraparound windscreen, separate bumpers, and raising the position of the headlights. When production of the Mark 1 ended in 1955, a total of 565 Mark 1's had been built, of which 102 were Drophead Coupes, 458 Saloons, and the remaining 5 were Spiders. 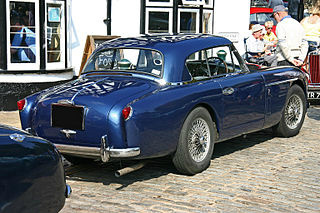 The Mark 1 sports car was powered by the same engine as used in the DB2 Vantage, and consisted of a Lagonda 2.6 litre, DOHC, straight six unit that developed 125 bhp at 5000 rpm, and 144 ft/lbs of torque at 2400 rpm. Fitted with a four speed manual gearbox, it produced a top speed of 111 mph, with a 0-60 mph time of 11.5 secs. However, by early 1954, both the Saloon and Drophead Coupe were fitted with the larger 2.9 litre, DOHC, straight six Lagonda engine that developed 140 bhp at 5000 rpm, and 178 ft/lbs of torque at 3000 rpm. Retaining the same gearbox and fitted with two SU HV6 carburettors, it produced a top speed of 118 mph, with a 0-60 mph time of 9.7 secs. It used hydraulic drum brakes all round, and there was now a marginal increase in weight to 1210 kg. 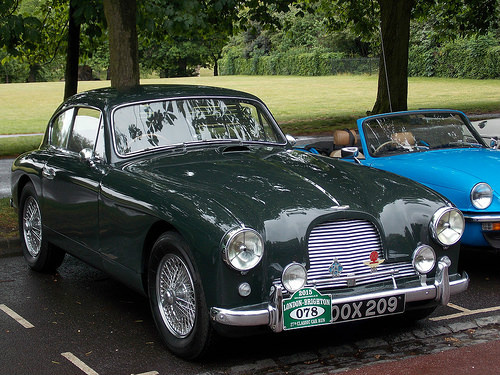 Also in 1955, Aston Martin Launched the Mark 2 version. 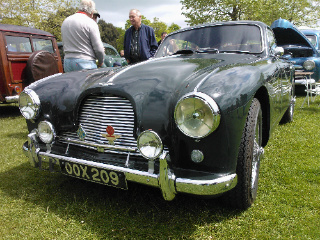 External styling changes included the addition of small fins at the rear, different rear lights as used in the Morris Minor, and an increase in the use of chrome. A new two seater Fixed Head Coupe variant was introduced, whilst retaining the Drophead Coupe, although only 34 units were produced using bodies hand-made by the Tickford Company, which had been acquired by David Brown in 1954. As part of a special order, three of these chassis were dispatched to the Italian coachbuilders Carrozzeria Touring in order to create the Spider Variant. By the time production of the Mark 2 ended in 1957, a total of 199 units had been built, of which 146 were Saloons, 34 Fixed Head Coupes, 16 Drophead Coupes, and 3 Spiders. As an optional extra, the Mark 2 sports car was fitted with the more powerful version of the 2.9 litre, Lagonda engine which included larger valves, and the compression increased to 8.6:1. This enabled output to increase to 165 bhp, and produced a top speed of 120 mph, with a 0-60 mph time of 9.3 secs. An Aston Martin DB2/4 in good condition would command in the region of $120,000/£75,000 to $250,000/£150,000, whilst a really superb example would fetch around $500,000/£300,000.